Next week the San Francisco Board of Supervisors votes to approve changing the name of Phelan Avenue to Frida Kahlo Way. This is far from the first such change for this neighborhood’s streets, and a good occasion to look at the several other name changes over the years since its beginning. 1891. Sunnyside homestead map. About 3’x6′. Photographed and montaged by Amy O’Hair. San Francisco History Center. San Francisco Public Library. View larger. Detail from southwest corner of Sunnyside homestead map. Only three of eight street names here are still in use. View larger. Current map of Sunnyside. OpenStreetMap. View larger. Only a few years after the homestead map above was submitted to the City, one street name was changed. What originally was Moulton Avenue became Hearst Avenue in 1895. Frank Fielding Moulton (1856-1920) was born in Gold Rush San Francisco to a wealthy family from New Hampshire; he invested in real estate like everyone else with money in late-nineteenth-century San Francisco. When the Sunnyside Land Company was formed in January 1891, he was one of the directors. His own home was a Nob Hill mansion, and he may never have even set foot on his namesake street here. He soon retired to his San Mateo County estate and did not play any part in the running the property speculation project called Sunnyside. There were already two other streets named Moulton at the time—Moulton Street in the Marina and Moulton Place in North Beach (now Montague Pl). In 1895 the SF Board of Supervisors changed many street names. (Read the whole report here). Sensibly enough, Moulton Avenue in Sunnyside, as a latecomer, had to go. Hearst was chosen. The gold mining tycoon George Hearst (1820–1891) had died only a few years before, and was greatly admired. George Hearst, the Gold King. From Wikimedia.org. William Issel calls him a “brilliant self-taught mining geologist [who] reaped a fortune from the Comstock Lode in the 1860s”; he controlled vast assets all over the West and Mexico. He gave his son William Randolph Hearst the San Francisco Examiner, who then developed it into the twentieth-century powerhouse it would become. At the time, there was also a Hearst Street in Oceanview, but that was changed to Lakeview Avenue. Perhaps the Sunnyside street was thought to be a slightly nicer tribute to the Gold King. Still, both neighborhoods were bare-dirt, sparsely inhabited working-class areas. The next set of Board of Supervisors changes came after the 1906 Quake and Fire. In 1909 Sunnyside underwent three more street-name changes in another sweep by City Hall. (Read the whole report here). On the south there had been Spreckels, Wieland, and Milton Avenues. The post office, and anyone else in search of addresses in this growing area of town, were understandably confused, as there were also streets named Spreckels and Wieland in Visitacion Valley (both now gone after that neighborhood’s streets were later redesigned), and two Miltons that predated Sunnyside–one in Spring Valley homestead (still found off San Jose Ave) and one in Oceanview (now Crystal Street). How could the city have got into the state of having three different streets with the same name in far-flung neighborhoods? All residential development in the late nineteenth century was a matter of private capitalists buying up land, laying out their own idea of a street grid, and taking a map down to the City Surveyor to be rubber stamped. No pressure to match your streets up with other “homesteads” or to make sure your street names were not already taken. The notion of civic planning did not get a foothold until much later. Sunnyside’s original streets were named for or by the initial group of investors. 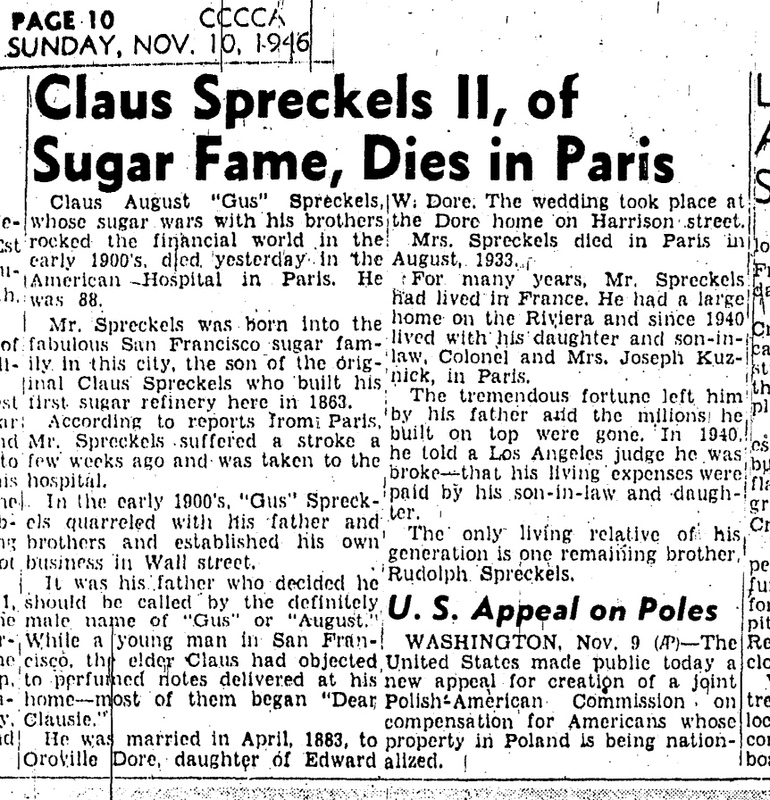 Claus Augustus (‘Gus’) Spreckels (1858–1946) was son of Claus Spreckels, the Sugar King, and was a Sunnyside Land Co investor. Gus Spreckels had the dubious honor of tipping the first domino in Behrend Joost’s demise as an electric railway baron by calling in a loan in 1893 (read that story here). This scion of the famous SF dynastic family estranged himself from his bullying father Claus during this time, and later died apparently happy and free in Paris. Read his obituary here. Robert P. Wieland (1861–1908), heir to the massive Philadelphia Brewery fortune that his father John H. Wieland made, was also one of the twenty initial investors. Robert P Wieland, heir to the Wieland fortune and dashing man about town. Bob Wieland was frequently seen at the race track and prone to public a cappella singing when sufficiently pleased with life. He affected a dainty cane. 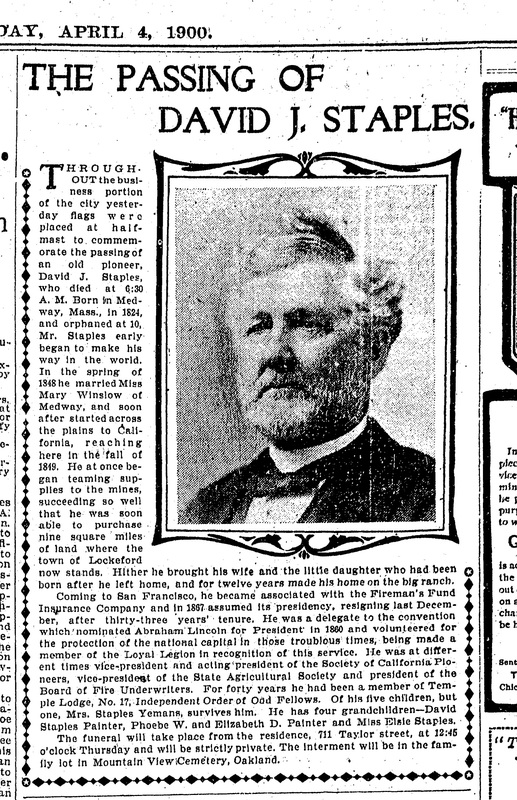 His best buddy was John Henry Mangels, another Sunnyside investor (but that story will have to wait for another post). But after the Quake, the City took more control over its own development. Just putting up capital in real estate speculation was not sufficient virtue to have a street named or renamed for you. In the 1909 changes, the Sunnyside Milton was changed to Marston, Spreckels to Staples, and Wieland to Judson. All three of the new names referred to figures in California or San Francisco history, as befitted the city as it worked to buff its civic image in those years. David Jackson Staples (1824–1900) was a 49er who later ran the Fireman’s Fund Insurance Company for many years—an important position in a town that regularly burnt to the ground. Read his SF Call obituary here. Read his SF Chronicle obituary here. David J Staples, from obituary, SF Call, 4 Apr 1900. David’s wife Mary P. Staples (1830–1895) was an well-recognized philanthropist who founded the Children’s Hospital and the Lick Home for Old Ladies, among other projects. The list of her good works was impressive — her obituary was longer than her husband’s. Read her SF Call obituary here. 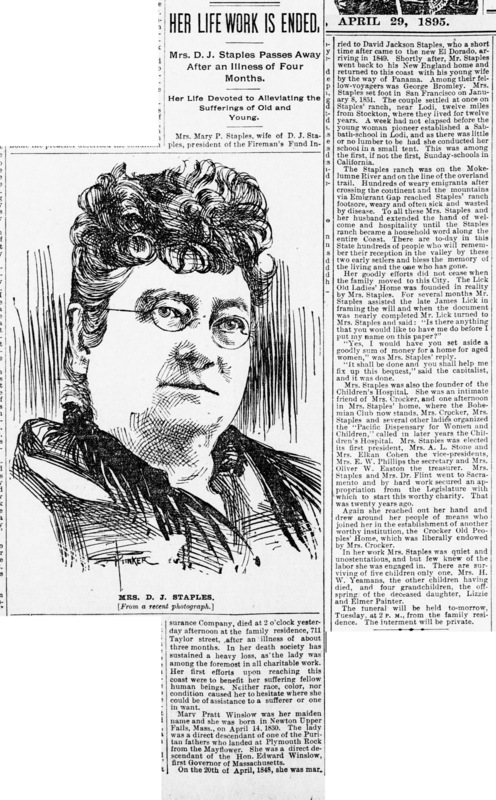 Mary P Staples, from obituary, SF Call, 29 Apr 1895. Egbert Putnam Judson (1812–1893) was a chemist and inventor who came to San Francisco in 1850. He was instrumental in supplying the Giant Powder Company with an acid critical for an important explosive. 1873. 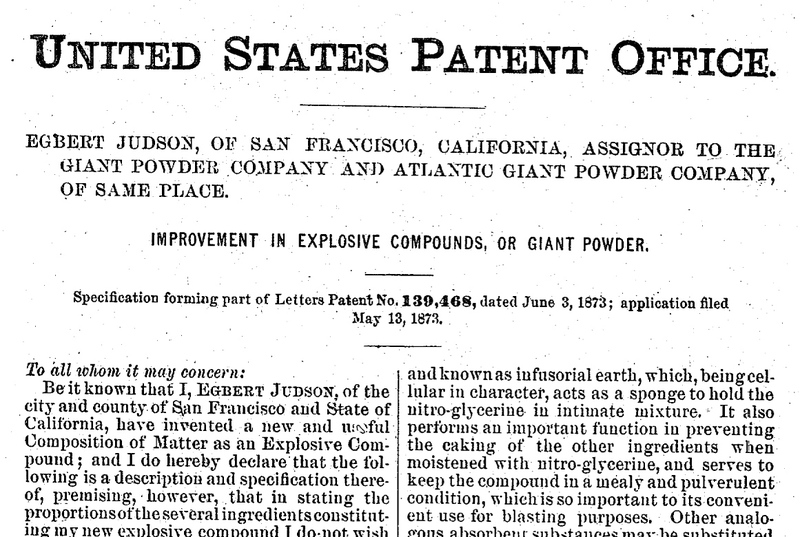 Egbert Judson’s Giant Powder patent. Read whole sheet here. Busting through hillsides effectively made California’s railways happen, and people were naturally appreciative. As for the Milton replacement, Captain Ward Marston (1799–1882) was a US Marine Corps officer who fought in the Battle of Santa Clara in 1847—putting down a revolt by the Californios who were for some reason angry about the theft of their land by US immigrants. Rendering of 1847 Battle of Santa Clara. Capt Marston is the dashing one on a black horse with a bicorne hat on. From AztecClub.com. Havelock Street itself had been Henry Street until the 1880s, getting its change then to avoid confusion with two other Henry Streets in two other neighborhoods. I have often had the impression that some street naming and renaming in these years was conducted during lunchtime drinking sessions by the members of the Streets Committee or their underlings. This brings us to Sunnyside Avenue, which is now Monterey Boulevard. As seen on that 1891 homestead map at the beginning of this article, the neighborhood’s main drag was naturally eponymous. James P McCarthy (1847–1924), who made the large purchase of Rancho San Miguel land that became Sunnyside, Oceanview, Miraloma Park, and other neighborhoods, had previously laid out the Melrose District in Los Angeles, with an eponymous street down its middle and a streetcar to take you there—just as Sunnyside was planned a couple years later. Behrend Joost, president of Sunnyside Land Company, would have needed his guidance, having nothing more than a history of hardware sales and some dicey, though profitable, investments under his belt. Until Westwood Park and Westwood Highlands were planned in the late 1910s, Sunnyside Avenue dead-ended at Sutro’s Forest at Hamburg Street, where no one could pass. 1910. The forest at the end of the road. Looking west at the end of Sunnyside Ave (Monterey Blvd). The fence at the end marks location of present Ridgewood Ave. Courtesy of the Sutro Library. In 1916 the name Monterey Boulevard was chosen for the extension of Sunnyside Avenue through the new developments to the west. The lack of an outlet for Sunnyside here had long been a source of resentment in the neighborhood, so when that land was sold and opened up, most everyone would have been pleased. 19 Nov 1916, SF Chronicle. Monterey Boulevard completed. Taken at north end of Miramar Ave. Note that the forest is not yet razed. Read whole article. But then the neighborhood lost its self-named street. In 1920, Sunnyside Ave itself was changed to Monterey Blvd, including a bit of Circular Ave at the far eastern end. It has been said elsewhere that the residents of Sunnyside did not want this change—and this is certainly likely—but when the matter was proposed in 1919 by the Planning Commission, there were no objections placed in the record that I was able to find. The last change to happen before the current one that is planned was in 1927, when Hamburg Street was changed to Ridgewood Avenue. In the original layout, as seen in the map at the beginning of this article, Hamburg completed the short run of alphabet street names starting with Acadia on the eastern end of Monterey Blvd. The change was not the result of leftover WWI anti-German sentiment. Too many years had passed after the end of that war, and the next one was well in the future. When perceiving a threat, San Francisco in this era tended look westward; in its anti-Asian years the City erased Japan, China, and India Avenues in the Excelsior, but never altered Munich Street. I surmise the rationale for the change to Ridgewood–which is the boundary between Sunnyside and Westwood Park/Westwood Highlands–was to make that street into a better match for the sylvan, wood-themed names found in the tonier neighborhoods to the west. It is unlikely the families on Hamburg Street were asked whether they liked the new name, and they were not likely to be thrilled about the hassle of implementing a new address. This time around, nine decades later, SF Supervisor Norman Yee’s office worked with the few households on Phelan Ave, for their input and to ease the change for them. 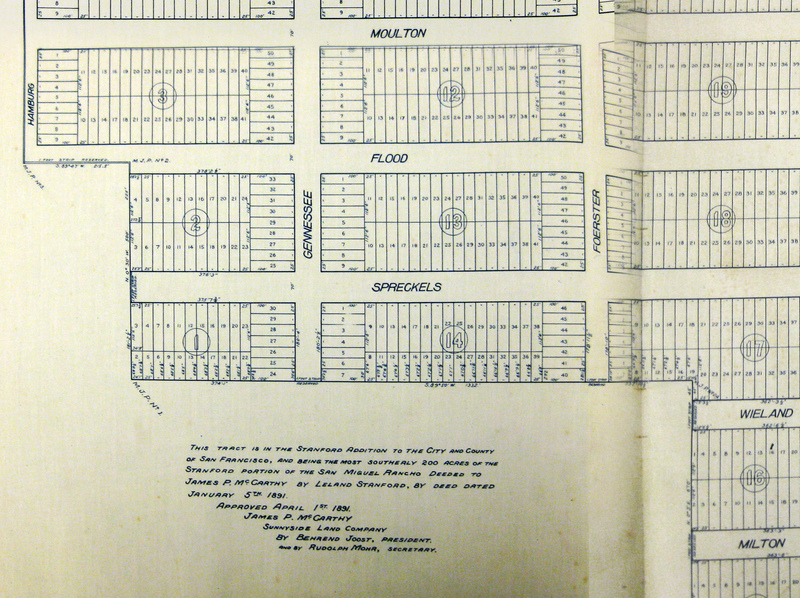 Phelan Avenue was not part of the original plans for Sunnyside; the land that would be given for the two block stretch inside the original boundaries, from Judson to Flood Avenues, was intended as lots for houses. When the City finally cut a route from the south edge of Sunnyside down to Ocean Avenue—this had been another dead-end corner of the neighborhood—the name of Phelan was chosen, though I did not find the record of the official decision. Phelan Avenue was first cut through and graded by a group of Sunnyside men, seemingly every male under 50 in the district, in January 1898. The City had given a strip of land for access from Sunnyside to Ocean Ave and the Ingleside district, on the condition that locals would actually do the work. the modest thoroughfare did not have a name for the next few years. SF Examiner, 31 Jan 1898. The name ‘Phelan Avenue’ first turns up in print in newspapers in 1907. Here, a man hit by the San Francisco & San Mateo Electric Railway streetcar is reported to reside there. It was apparently nothing more than a narrow dirt road next to the Ingleside Coursing Park, providing a needed route from Sunnyside to Ocean Avenue. 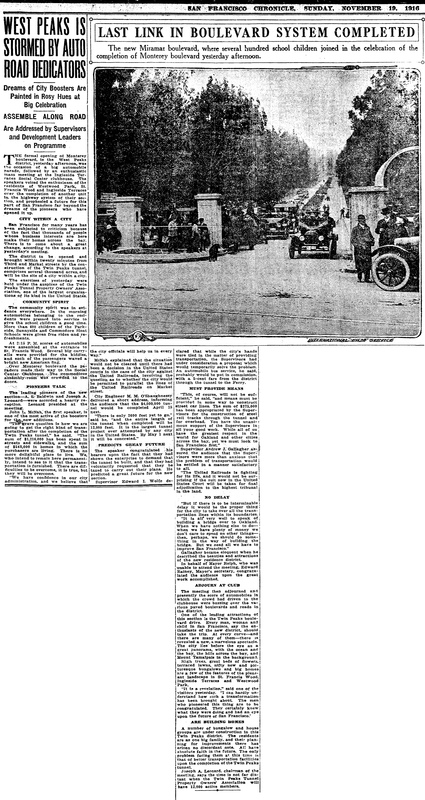 SF Call, 6 Nov 1907. The dedication of Balboa Park in 1910 would have given the new street more importance. It appears in some fashion on maps about 1913, and in 1914 it is graded and improved. Of the houses standing on the street currently, the earliest was built 1912, though Mr Mitchell in the news piece above was living in some structure there in 1907. Only one quarter of Phelan Avenue’s length has houses, just a dozen or two. The other portion is home to City College of San Francisco and Archbishop Riordan Catholic High School for Boys. The choice for the new name of Frida Kahlo (1907–1954) has largely been driven by advocates at City College, in part to honor Kahlo’s association with Diego Rivera, who painted the Pan-American Unity mural, which is now housed in the campus theater named for him. Frida Kahlo, as painted by Diego Rivera, in a portion of the Pan-American Unity mural at City College of San Francisco. More importantly, the proposed name change recognizes Kahlo’s own remarkable body of work, both as a painter and in the service of social justice for women—all the more astonishing for her lifelong endurance and self-transformation in the face of an overwhelming physical injury, disability, and ill-health. History does best when it serves the present. It lends perspective and resonance, but becomes vitiated if used as an excuse for petrifying mistakes. Phelan was as flawed as many of his contemporaries, as well as having done good things for the city. But he mounted a public campaign based on his hate and fear, so they became more than just his personal failings. This change strikes me as an excellent opportunity to let go of something from the past and welcome another name, another history.